Video clip synopsis – An Indigenous community works hard to make a profitable, self-sustaining market garden. The aim is to create jobs for as many of their community as possible. Broadband MP4 market_bb.mp4 (5.3MB), suitable for iPods and computer downloads. 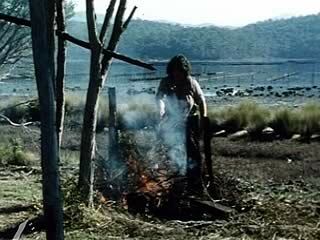 Indigenous Community Market Garden is an excerpt from the film Working Together (12 mins), produced in 1973. Working Together: The Community Employment Program provides funds to assist groups develop community projects that will provide work for the long-term unemployed. This film shows four CEP projects that were developed and implemented by Aboriginal communities: a home care service in Casino, NSW; a landscaping project in Baryulgil, NSW; a market garden in Eden on the NSW south coast; and the Aboriginal Women’s Unit, which employs information officers across Australia to assist women set up projects to meet their specific needs. Working Together was produced by Film Australia for the National Aboriginal Employment Development Committee. European invasion and settlement of Australia severely disrupted the economy and culture of many Indigenous people. Many of these people became dislocated. Recently there have been certain efforts made to find ways of engaging Indigenous people in economic activities that are sympathetic to their culture. Recent Australian governments have been committed to developing business and employment opportunities for Indigenous people to increase their economic independence. The philosophy behind this is the belief that economic independence is essential to increasing the confidence, wealth, social direction and community empowerment of Indigenous people. Operating since 1977, the Community Development Employment Projects (CDEP) scheme is now the Australian Government’s largest Indigenous program with funding of approximately $490 million per year. The scheme provides for more than 36,000 participant places through around 280 community organisations across Australia. Participants in the scheme subsidise two thirds of the scheme’s costs by voluntarily working for their Income Support Benefits. CDEP provides work and community development, assists with employment creation and the establishment of successful businesses and assists Indigenous Australians to gain training and skills which are necessary for employment in the mainstream labour market. CDEP provides fulfilling opportunities to Aboriginal and Torres Strait Islander people in those areas of Australia where jobs are scarce. Describe the attitude of the Aboriginal leader towards reliance on welfare and the hopes he has about his project. ‘Operating since 1977, the Community Development Employment Projects (CDEP) scheme is now the Australian Government’s largest Indigenous program with funding of approximately $490 million per year. The scheme provides for more than 36 000 participant places through around 280 community organisations across Australia. Participants in the scheme subsidise two thirds of the scheme’s costs by voluntarily working for their Income Support Benefits’. Aboriginal leader Noel Pearson has argued recently that one of the greatest problems facing Aboriginal communities is welfare reliance. Do you think this scheme would be a solution, or part of the problem? Write a 300-word explanation of your point of view. Research, discuss and list at least ten points and five facts about the issue, ‘Work for the dole’. Write a 600-word persuasive text (letter, media article, essay, speech) presenting your point of view on this issue. Indigenous Business – A Cattle Station excerpt from The Yugal Cattle Company, Commonwealth Film Unit & Department for Aboriginal Affairs, 1973.